It is well known that every activated carbon will remove hydrogen sulfide from biogas to some extent. Hydrogen sulfide will adsorb on the internal carbon surface where it can be oxidised in presence of oxygen to sulphur. Ash constituents like iron oxide, can accelerate and improve the H2S removal. The H2S removal capacity of plain activated carbon is usually not attractive due to the low removal capacities. For cost-effective hydrogen sulfide removal from biogas, the removal capacities and rates are boosted by impregnating the activated carbon with suitable chemicals. 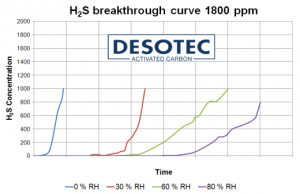 DESOTEC’s R&D chemists and engineers studied different base materials, different salts, metal oxides or alkalines and impregnation routes to improve the hydrogen sulfide removal properties of the products used in the biogas purification process. 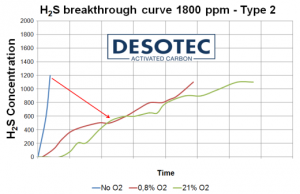 DESOTEC’s R&D chemists and engineers did a lot of research to design, develop, and produce an activated carbon with unique properties for H2S removal from biogas. Hydrogen sulfide removal in biogas can be done on the wet biogas leaving the digester, or on the dried gas. Since the first step in the H2S removal process is the absorption of the H2S into the adsorbed water, it is important to understand the impact on the relative humidity on the biogas purification process. Figure 1 - Water vapour adsorption at 20°C The amount of water adsorbed on activated carbon depends on the relative humidity and temperature of the gas. The water vapour adsorption equilibrium on activated carbons typically exhibit hysteresis. The size and shape of the hysteresis loop which separates the adsorption and desorption branches is a strong function of the pore size and interconnectivity of the pores and thus the raw material and activation process used to produce the product. Figure 1 shows the water vapour adsorption equilibrium of AIRPEL 10-3 at 20°C.Different activated carbon products were tested in dynamic pilot test for H2S removal at different humidities. Figure 2 shows typical H2S breakthrough curves for one of the tested development products that were obtained at different relative humidities. 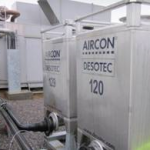 The results indicate faster H2S removal kinetics at higher humidity. Once the hydrogen sulfide is absorbed in the adsorbed water, it can be oxidized to sulphur. The formation of sulphur and water occurs by means of sulfide oxidation in presence of free oxygen. From the above oxidation reactions, it can be understood that the molar ratio of H2S to O2 will impact the overall removal kinetics. Figure 3 shows the H2S breakthrough curves of one of the development products. By altering the recipe of the product used in this initial test work our R&D chemist found a way to improve the overall performance of our products for the application. The results of the H2S breakthrough curve run under similar conditions are shown in figure 4. Based on our research, we finally developed AIRPEL® ULTRA DS, an extruded impregnated activated carbon with enhanced adsorption capacity for sulphur compounds especially developed for air and gas purification applications. Under the right conditions, loading rates of over 100 wt% sulphur can be achieved. 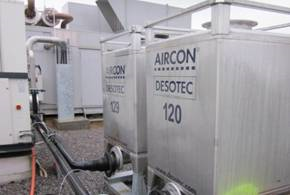 For more info on hydrogen sulfide removal and biogas treatment solutions in general, don’t hesitate contact us!